In this edition, John looks at early Test players with Aussie connections, England second-row pairings, wing Test captains and the Youngs family's unique achievement. Alexander William "Alec" Pearson was the first Australian-born player capped by England. His father was a Scot who went to sea at an early age before settling as a farmer north of Melbourne where Alec was born (at Mount Ridley) on November 30, 1853. The family came to England in the late 1850s for the children to be educated at Blackheath Proprietary School where the young Alec excelled at both codes of football. He subsequently played rugby for Blackheath. The club was the best in the land in the 1870s and a club-mate was Lennard Stokes, one of England's most distinguished early players. Stokes was a medical student at the time and persuaded Pearson to turn out with him for Guy's in Hospital Cup ties, even though the Australian never enrolled there. He and Stokes made their Test debuts together as England's full-backs in the first-ever international match with Ireland, played at The Oval in February 1875. Teams comprised 20-a-side then and it was common for two full-backs to occupy the last line of defence. An early critic described Pearson as "a very steady back, a good tackle, and excellent drop and place kick." Between 1875 and 1878 he was capped seven times. Teams in international matches had been reduced to 15-a-side in 1877, though until the end of the decade it remained the norm to field two full-backs. During his international career Pearson was only on a losing side once and England never conceded a try during his tenure. He returned to Australia in the 1880s to help run the Mount Ridley Estate which was later sold. After that he maintained an interest in farming and was a Horse Racing enthusiast becoming a steward of the Australian Jockey Club in Melbourne. Later he settled in Dandenong where he took an interest in local issues and was a J.P. Alec Pearson died at his home on the January 27, 1930, aged 76. Maurice Barlow was a forward in Ireland's first international match, against England in 1875. Dublin-born and raised, he played for the Wanderers club. Within three weeks of his sole cap he embarked on the Loch Rannoch for Australia, arriving in Melbourne in late May 1875. He settled in Sydney where he played rugby for the (now defunct) Wallaroos club. The first-ever inter-state match between Queensland and New South Wales took place on August 12, 1882. Barlow was missing from that match but he did take part in the second inter-state match on Tuesday August 22. Nine days later, NSW embarked on the first-ever overseas rugby tour - a seven-match visit to NZ. Barlow was not on the tour, it being stated at the time that several leading players had problems obtaining leave. The tour party was only 16-strong. In an interview in 1912 Barlow recollected that, during his time in Sydney, he had played rugby with the young Gregory Wade, an Australian who was a prolific try-scorer for England in the 1880s while he was studying at Oxford. Maurice Barlow was a surveyor/engineer and in June 1878 he was licensed to be a surveyor under the Crown Land Acts. He became district surveyor in a number of Aussie townships in New South Wales, Queensland and Victoria and was prominent in Sydney and Melbourne social circles where he seems to have taken particular interest in horse-racing and Polo. He died in Woollahra in the Eastern Suburbs of Sydney on April 22, 1935 aged 85. Since winning the 2003 RWC England have played 104 Tests. The current second-row -Joe Launchbury and Geoff Parling - is the 27th different starting pair to have been used - so an average stint of only 3.85 Tests per duo. In that time no pairing has had a run of more than five successive Test starts and only two pairings have been together in all for more than ten Tests: Steve Borthwick and Simon Shaw (16 together since 2003 - they had one other before then) and Danny Grewcock and Ben Kay (eleven - with four more before 2003). 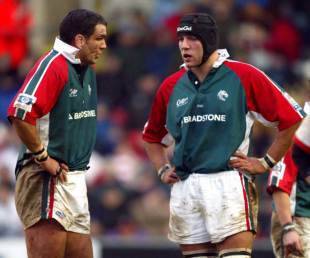 The all-time top pair of England second-rows was the Oxbridge and Harlequins duo John Currie and David Marques. They came together as undergrads for England against Wales in January 1956 and were never split for five full years, playing in the 1957 Grand Slam and 1958 and 1960 Five Nations-winning Championship teams. England also won the Triple Crown twice during their reign. England only played four games a year in those days - they didn't tour overseas until 1963 - and incoming tours were at a rate of about three a decade. Even so, all told Marques (originally capped from Cambridge) and Currie (of Oxford) played together in 22 consecutive Tests. Their last pairing was at Twickenham against South Africa on January 7, 1961, holding their own in a narrow 5-0 defeat against a famous Springbok pack that included Doug Hopwood, Frik du Preez, Johan Claassen and Avril Malan. They were selected to face Wales a fortnight later but Currie fell foul to 'flu, had to withdraw on the Thursday before the game and was replaced at a late hour by Ray French (the rugby league commentator). Between 1871 and 1982, when Bill Beaumont had to retire prematurely on medical advice, only two other England second-row pairings played together more than ten times. Beaumont featured in both partnerships: with Maurice Colclough (a dozen times) and with Nigel Horton (eleven Tests together). John Orwin and Wade Dooley came together as new caps for the Test against Romania in January 1985 and enjoyed a dozen second-row starts together before Paul Ackford joined Dooley in a successful partnership that lasted 20 Tests. Tour Tests and Rugby World Cups had made matches at the highest level more frequent by this time. Ackford & Dooley's first and last matches together were against the Wallabies - in a famous 28-19 win at Twickenham in 1988 and a tight 12-6 defeat there in the Final of the 1991 RWC. Their partnership included the 1991 Grand Slam, England's first for eleven seasons. Martin Johnson entered the Test fray as a late replacement for Wade Dooley against France in 1993. He partnered Martin Bayfield in a 16-15 Twickenham win and the pair went on to start together in 18 Tests until 1996, when Bayfield had to give up the game through injury. Johnson also had eighteen Tests together with Ben Kay in 2002 and 2003, when he retired after the RWC Final. He also started 15 Tests with Danny Grewcock as his partner (1999-2002). The argument against wingers (and full-backs) captaining sides is that they are too far removed from the action to be able to make informed tactical decision during a game. New Zealand, for instance, have had only one wing (Stu Wilson twice in 1983) and two full-backs (Mick O'Leary twice in 1913 and Mils Muliaina, who deputised for Richie McCaw three times in 2009) in their 498 official Tests since 1903. Among the all-time leading 35 captains in Tests only two are wingers. Philippe Saint-André lies 24th on the list with 34 matches as captain of France (between 1994 and 1997) and Ieuan Evans occupies 35th place with 28 Tests to his name as captain of Wales (1991 to 1995). Evans, it will be remembered, was Wales's most-capped captain until overtaken by Ryan Jones during the recent round of autumn internationals. The only wing to lead a Lions tour party on a major tour since 1891 was Scotland's Arthur Smith in South Africa in 1962. He captained Scotland from the wing 15 times and skippered the Lions in three Tests against the Springboks. Before him in 1891 his compatriot Bill Maclagan led the first British touring side to South Africa. He was the only other Lions wing to lead a tour party, skippering the side in 18 of its (unbeaten) 19 tour matches including the three-Test series. Teddy Morgan (twice against Australia and in the inaugural game with New Zealand) led the 1904 Lions in Tests from the wing position when the tour captain was unavailable owing to injury. Nick Youngs (England 1983-84) is unique among fathers of England internationals: no other Test player has seen two of his sons start in the same match for England. The Youngs, moreover, have all started in winning Tests for England against New Zealand. Nick was a member of Peter Wheeler's England team that beat the All Blacks 15-9 at Twickenham in November 1983. His sons Ben and Tom started in the side that won 38-21 at Twickenham last Saturday. There are a few examples in other countries - the Quinnells of Wales, the Collopys of Ireland and the Leslies (father for New Zealand and two sons for Scotland) spring to mind. The only other England family where a father and two sons won caps was the Miltons. William (later Sir William) Milton played for England in 1874 and 1875 before joining the Cape Civil Service in South Africa where he had the distinction of captaining his adopted country in one of its earliest cricket Tests. Two of his sons were later capped by England, though not in the same match. Cecil Milton played in the centre for England once (against Ireland) in 1906 and his younger brother John - a strapping forward known as "Jumbo" - was actually capped from Bedford Grammar School three times in 1904 and returned for one appearance in 1905 and another in 1907 while studying mining engineering at Camborne.